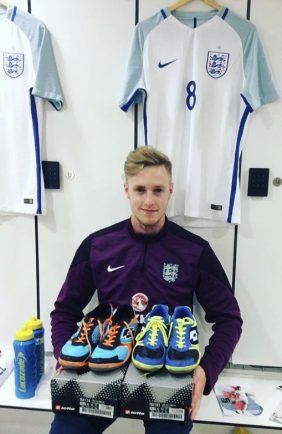 A UNIVERSITY of Worcester student looks set to represent his country in an upcoming futsal European Championships after being called up to the England squad. Experienced international Paul McHugh who is studying for a Master’s in Sports Coaching Science, will be among players in the visually impaired futsal national squad taking part in the IBSA (International Blind Sports Federation) European Championships. The tournament, in Georgia, runs from today Wednesday (December 5) to December 15. The 22-year-old said: “I feel honoured as always to be selected for the squad and I’m very much looking forward to the challenge. I’m hopeful that the squad can improve upon our second place finish at last year’s World Championships. Paul, who is partially sighted, but also plays mainstream futsal, has been a part of the England Visually Impaired Futsal Senior team from the age of 16, and since then has been capped 26 times, scoring 26 goals at major international competitions. His numerous achievements at international level include, aged 16, being in the team that came home with a bronze medal from the World Championships in Japan in 2013. He won the Golden Boot at the European Championships in 2015, a bronze medal at the 2016 European Championships, as well as the Silver Boot, and most recently a silver medal at the 2017 World Championships in Italy. Partially-sighted futsal is largely unchanged from the rules of futsal. The only alteration to the sport is for the goalkeepers, who are fully sighted and therefore restricted to inside the penalty area. Paul began playing futsal aged 10 and, as a teenager, played for a number of professional football academies, including Burton Albion, Stoke City and Birmingham City, but went on to pursue his international career. “The fast paced and technical nature of the sport really attracted me and allowed me to develop both as a futsal and football player,” he said. He is captain of the University’s men’s futsal first team, as well as the co-founder and chairman of Worcester Futsal Club, the city’s leading futsal setup. He is one of many who are working to develop futsal in the city, including several University students. Paul has a sports scholarship from the University, a package provided to its high performance athletes, which provides him with not only financial support, but also additional support and guidance on both his elite training and performance, as well as his academic studies. “The University scholarship has allowed me to fund various training activities which are crucial for maintaining elite performance; therefore enabling me to be in the best shape possible leading into the European Championships whilst balancing my Masters in Sports Coaching. “Playing regularly for the University Of Worcester first team alongside Worcester Futsal Club within the FA national league has proven vital to my match sharpness also. “Fortunately both teams have remained unbeaten this season winning all fixtures, so I feel extremely positive and hopefully I can continue the winning habits at international level,” he added.